È il modo con cui stiamo nel mercato, che ha successo. (en)Our market position is a demonstration of our success. Lombardini22 è al 3° posto nella classifica 2018 de Il Sole 24 Ore delle società di architettura italiane in base al fatturato. Un grande risultato che ha raggiunto grazie a tutta la comunità con cui lavora. Gli elementi chiave di questo successo, molto apprezzati dalla comunità Real Estate, sono il processo strutturato che parte dall’ascolto del cliente e la creazione del valore in ogni progetto. Lombardini22, insieme ai suoi partner, continuerà a risolvere i problemi e ad aggiungere valore. 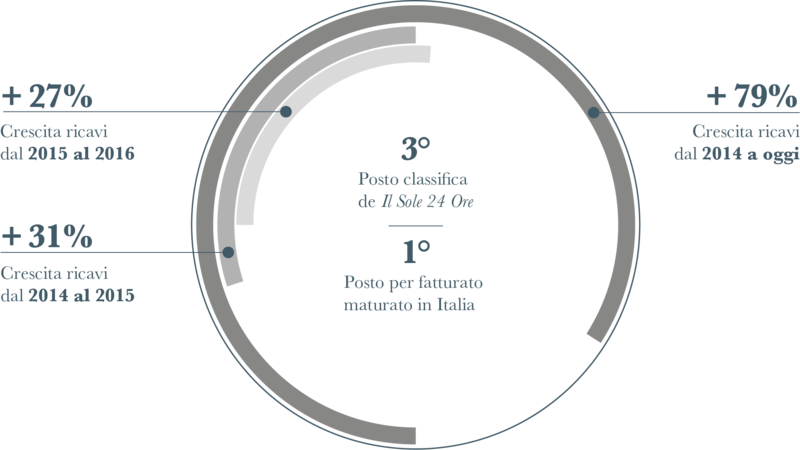 (en)Lombardini22 came in third in Italian newspaper Il Sole 24 Ore’s 2018 classification of Italian architecture firms by turnover. A wonderful achievement, and one of which the agency is very proud. We have our wonderful team to thank for this, of course, but also each and every individual we have worked with over the years – our partners, the Lombardini22 community. Key to this success, and highly appreciated by the Real Estate community, is our structured process, which begins with listening to our clients, and ensures the solving of problems and the creation of value in each and every project.